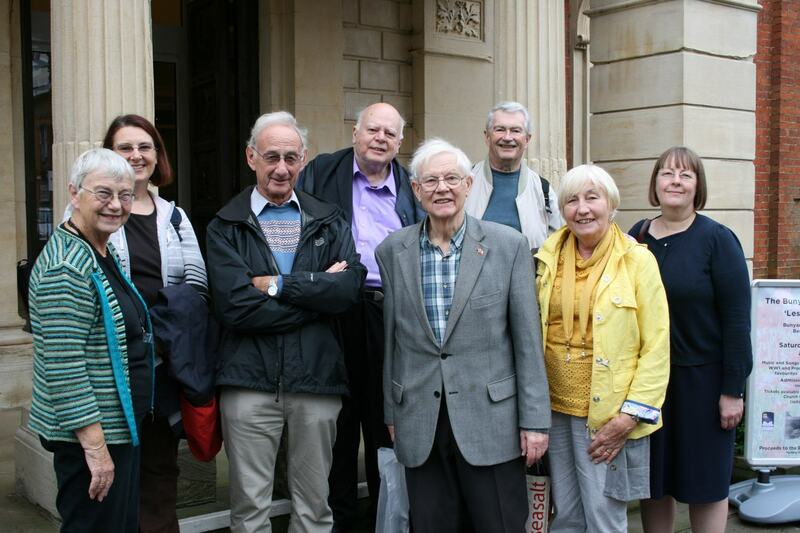 Although LCF/CLIS members have visited the John Bunyan Museum in Bedford a few times over the years, in October 2014 Graham Hedges was the only one of our party of eight who had been before. The Museum is next to the Bunyan Meeting church which is a fine building – the third on the site. We had time for a cuppa and cake at the church café before moving next door to the Museum itself. Our tour guide first introduced us to an impressive Madame Tuwsaud’s quality life-sized model of John Bunyan which had cost over £7,000 fifteen years ago. 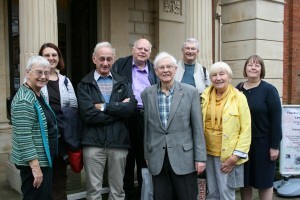 Members of the group with our guide to the museum. We proceeded through a replica kitchen of Bunyan’s time to a model of Bunyan as a young apprentice at his anvil. Remarkably this really was his anvil, found by chance and discovered to have his name carved on it. He must have been a gifted metal worker as the Museum houses a metal violin he made which apparently plays very sweetly. We were told that Bunyan did not allow the frivolity of music in church services. Perhaps this was in art a reaction against his own, self-confessed, youthful hedonism? ext came Bunyan as a young soldier, during which time he began to become spiritually awakened. Members of the party were then invited to mount one of the pulpits that Bunyan often preached from, which had come from Zoar Street Chapel in Southwark. We also saw his actual vestry chair and a replica of his prison cell with the very jug his blind daughter used to bring him soup from home. Our guide explained that the settings of various scenes and trials in Bunyan’s most famous book The Pilgrim’s Progress were local to the area, for example Vanity Fair being Bedford itself. In the ensuing discussion it was admitted by many that they had not actually read the book, the exceptions being those who had read many years ago as children. I have become very familiar with Geraldine McCaughrean’s version, which I would recommend as not only an excellent adaptation for children, but enjoyable and instructive for adults too. The Museum held many translations into other languages and other archive materials. To end the visit we were shown the beautify stained glass windows in the church , depicting scenes from The Pilgrim’s Progress, including the famous one that was sent as a postcard to Terry Waite in his time of captivity. As we left we admired the heavy church doors which were made from bronze scenes from the book – the church portico had been built especially to protect them. The afternoon bookstall at the lecture had a lovely looking book, which had been recommended as a guide and introduction by one of the party: The People’s Pilgrim by Peter Morden, published by CWR, February 2013, ISBN 978-185348361.